Service coordinator Alexandru Robu, 35, was on his way to work yesterday morning when the train he was on collided with a stationary one in front of it at 8.20am. "It happened so quickly," said Mr Robu, who was standing in the carriage closest to the collision. "It was a really big stop, and we heard a loud sound." The sudden stop threw him off balance. He tried to break his fall with his hand and landed on the ground. He estimated that 30 people around him also fell. "Some people fell on top of each other," said Mr Robu, who is from Moldova in eastern Europe. "Everyone took about one to two minutes to recover." An announcement then came on informing commuters that help would be arriving in about 20 minutes. The plan was to tow the stationary train away before the second train could pull into the platform. It was then that Mr Robu no-ticed a man on the ground holding his head. "He did not look good," said Mr Robu. He went over to the man, who started to look unresponsive. He said: "I tried to keep him engaged by talking to him and making sure that he was okay." 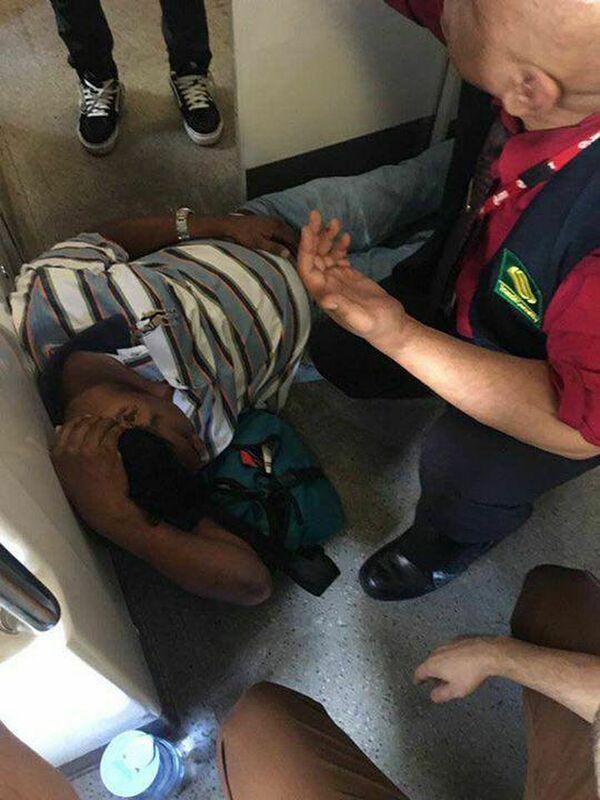 At this time, some people in the train were calling for an ambulance. Mr Robu pressed the emergency button to ask the driver if the first door could be opened to let the man out for fresh air. It was starting to get stuffy in the train. "There was no air-con," Mr Robu said. "People were also getting anxious." About 20 minutes later, a second announcement came on to inform passengers that the first door would be opened to let them out. People left in a proper fashion, guided by SMRT staff and police officers. Mr Robu stayed with the injured man, who was put in a wheelchair once he got out of the train, and made sure he received medical attention. Mr Samuel Ng, 48, a sports adviser who was getting off another train at about 8.50am, said that he saw people queueing to get out of the second train. He said: "There was no chaos, no shouting. When I went downstairs, there was also a very long queue at the control station." Commuters on the platform said that they heard a dull thud before people started screaming. Mr Ganeshan Sivalingam, 38, who was waiting at the platform for the train to Tuas Link, said he heard a "bang". When he went closer, he saw that the blocks of metal at the front of the second train had hit the rear of the stationary train. There was no chaos, no shouting. When I went downstairs, there was also a very long queue at the control station. MR SAMUEL NG, 48, a sports adviser who was getting off another train at about 8.50am. He said he saw people queueing to get out of the second train. Station operators then ushered him and other commuters out of the station, where he got on a bus to work. He said that the train station was "not very crowded", and it took about five minutes for him to leave the station. Parts of the platform had been cordoned off when Mr Robu left the train. Ground control staff from SMRT, and officers from the Singapore Civil Defence Force and the police directed commuters to leave the train station. The platform reopened at about 11.20am, and trains were running on only one side of the tracks. When reporters went to the National University Hospital and Ng Teng Fong General Hospital (NTFGH) in the early afternoon, the injured passengers were already being treated. The Straits Times understands that some had already been discharged at that time. Businessman Lim Kim Hock, 56, who runs a switchboard company, sent one of his workers, Mr Tan Ban Heng, 37, to NTFGH when he saw that Mr Tan's kneecap had become bloody and swollen. Mr Lim said he wanted to see Mr Tan's injuries when he found out that he was in the accident. He said Mr Tan had earlier declined medical help because the injury "did not look that bad". Mr Lim said: "Once I saw the injury, I told him he must go to hospital."